At the output of the generating stations, transforming stations step up the production-level voltage to the high voltage necessary to efficiently carry the electricity over longer distances. The power transmission lines are made of conductors such as overhead lines or underground cables. In spite of their apparent simplicity, these conductors conceal important influencing factors to the electricity transmission network. A power network needs to constantly change the circuits’ configurations. That means to put in or out of service this or that part of the installation. Power circuit interrupters include a number of apparatus with the main task to connect and disconnect power circuits rated 1000 Volts and higher. It is mainly used to isolate equipment or portion of a circuit for repair or maintenance. The disconnect switch has little or no current interrupting abilities. Its operation has to be done without any current flow in the circuit. It is a safety device with, usually, a visible breaking contact and it can be locked in the open position. It is a switch designed to close or open circuits and make or interrupt nominal currents. It is faster than a disconnect-switch and has current breaking capability. The circuit breaker fills the same function as an interrupter but has the ability to interrupt short circuit currents as well. It is the ultimate protection device on the power network. Apparatus on power circuits have to be robust and reliable, otherwise damage can be great on both hardware and personnel. It consists of intervening only on faults and only to correct and repair. This strategy has the advantage of spending only on service and parts needed in real time. It also avoids unnecessary spending on periodic maintenance and testing. On the other hand, the consequences of faulty interrupting equipment may disastrous and very costly in terms of power interruptions to consumers and the extent of damage to the equipment and surroundings, not to mention human safety. The gains expected on maintenance will quickly fade relative to the high cost of repair and loss of revenue due to power loss. It is a series of predetermined actions executed periodically, independently of the condition of the equipment. This method, if applied strictly, can cause a great deal of unnecessary work and increased costss. It is based on maintenance relying on the actual condition of the equipment. In order to state the condition of the equipment, extensive testing and statistical analyses are conducted periodically and based on experience and new technologies (computers, communications, monitoring, etc. ), corrective interventions are planned. Preventive maintenance is presently the most popular technique for maintenance management personnel in most of the utilities in North America. Experience has demonstrated that the real life span of the electrical equipment is higher than that estimated by the manufacturers, and equipment in good condition can continue to serve instead of being replaced. Every circuit breaker is factory tested (routine testing) before delivery, tested again on site after installation (commissioning tests), and periodically after that until the end of its life. The measured values are compared with the established tolerance’s limits. Most often, the commissioning test values are used as reference values. Any deviation from these values can indicate, with the right analysis, what course of action is to be taken. Before going deeper in discussing timing tests, we need to understand the circuit breaker first. An accurate analysis makes it possible to make decisions that are profitable to the breaker, the network and to the maintenance personnel. In order to achieve this, knowing the timing machine and the significance of the operating times is important but not enough. Knowing well the breaker itself, the reference values (timing chart) and the network characteristics is necessary. The circuit breaker is the most important and complicated of all types of power circuit interruption equipment. This is due to its highly important capability of interrupting the powerful short circuit current, over and above its normal role of conducting, isolating and interrupting nominal load currents. The arcing chamber is a closed volume containing a fixed contact, a moving contact and the interrupting medium. The current is established when the moving contact touches the fixed contact and interrupted when they part. An arc is created when the contacts part. The interrupting medium is responsible for quenching the arc and establishing the nominal level of isolation between the open contacts. Several chambers may be connected in series to serve higher voltage levels; in this case a grading capacitor is installed in parallel with each chamber to balance the voltage across the contacts when parting. The sudden modification of circuit characteristics, when circuit breakers operate, produces peak voltage impulses where the level is determined by the circuit characteristics. These impulses may reach very high levels and must be reduced. A well-known method is closing or opening in two or three steps on resistors. The voltage impulse levels are generally acceptable when interrupting nominal or short circuit currents, but they can be dangerously high when interrupting small capacitive or inductive currents. Sudden energizing of a circuit always generates voltage impulses with usually moderate levels, with the exception of closing or reclosing on long unloaded lines where the impulses, function of the line length, of the instant of closing or reclosing and of the discrepancy of the three poles, can reach extremely high levels. A resistor with a predetermined value is placed in series with an auxiliary contact. Both are installed in parallel with the main arcing chamber. The auxiliary switch is programmed to close few milliseconds before the main contacts on closing and to open few milliseconds after the opening of the main contacts on tripping. The programmed delay is called the insertion time. It is where the needed energy to part the contacts and to extinguish the arc is developed. It includes devices, called energy accumulators, to store the needed energy. The order to operate the breaker is launched in the control part of the circuit breaker, as an electric impulse of a fraction of a second duration. The order is then amplified in the operating mechanism to a complete circuit breaker operation capable of interrupting short circuit currents. The circuit breaker has special functioning characteristics. It is normally either closed or open for long periods of time, is asked to change state on occasion and rarely sees a short circuit current. It needs to change state efficiently after long periods of inactivity. The circuit breaker control must ensure correct closing action, whatever the closing current value, and ensure breaking (opening) at the required moment by releasing, by mechanical action or via a relay, the energy stored in the accumulators. This energy has to face opposing forces when closing or breaking circuits under load or not, and even stronger forces with short circuit currents. This means an excess of energy, when operated without load, has to be damped with a proper damping system. 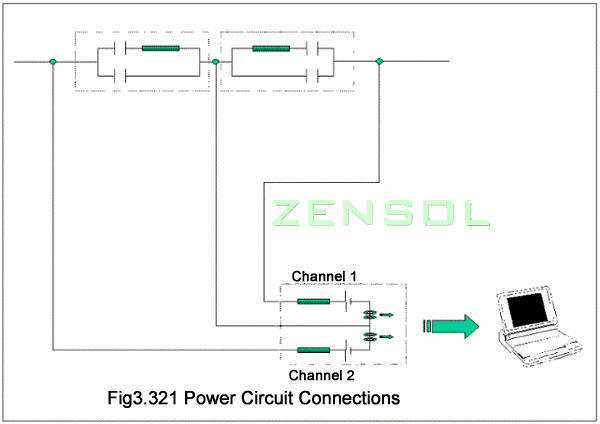 The circuit breaker has to be capable of executing different operation cycles and achieve fast breaking of short circuit currents, the faster the better for the network. Recent progress has reduced the response time from 5 to 3 cycles, and down to 2 cycles. It is already planned to have response times of 1 cycle. Operation has to be reliable, robust and easy to maintain. The main problem of circuit breakers stems from the nature of their existence. A circuit breaker has to interrupt weak capacitive or inductive currents, up to high short circuit currents, and as a result, to extinguish powerful electric arcs. The problem is then, essentially, an arcing problem. Another problem is overvoltage impulses; this is related to the nature of the circuit where it is installed. One of the major factors influencing the capacity of circuit breakers is the interrupting medium. It affects circuit breakers’ concept and design. By this principle, circuit breakers are classified in families according to the type of interrupting medium used. A good number of substances have acceptable qualities to be interrupting mediums. Mineral oil was, until recently, the interrupting medium of choice. It has excellent breaking and insulating quality especially when it is very pure, as is the case when it is used in certain devices such as capacitors or transformers, which are airtight devices. However, circuit breakers have breathing holes and the oil is in contact with the arc. Thus, one finds in the breaker’s oil a certain amount of impurities, in the form of moisture and miscellaneous dust, including carbon particles. This decreases its isolation properties significantly. It is imperative to monitor the state of the oil inside breakers in service, and to replace it periodically in function of the number of breaks performed by the device. The criteria for oil replacement depend on the structure of the breakers and are indicated by the manufacturer. The insulating quality of air rises rapidly with its pressure. In practice we can count on a disruption voltage of up to 90 kV between contacts separated by 1 cm at 10 bars pressure, and 1.5 times this value for the same distance at 20 bars pressure. Compressed air was mainly used for interruption in the earlier pneumatic circuit breaker designs. Later on it was used for insulation between the contacts after they opened, the latter being placed inside an insulating chamber designed to resist the air pressure. This reduced significantly the distance between the open contacts. It should be noted that the excellent quality of air is greatly affected by the humidity. Indeed, it is important that any condensation in the insulators and air conduits be avoided, or internal tripping may occur. Installing the costly drying compression stations greatly raises the cost of operating air blast circuit breakers. A certain number of gases, called electronegative, have better insulating qualities than air. Among them is sulfur hexafluoride, SF6, has seen a great deal of success in electrical apparatus design because of its excellent insulating properties and remarkable arc quenching abilities. It is five times heavier than air, odorless, colorless, nonflammable and non-toxic when new. Its dielectric strength is 3 times the air’s dielectric. When subjected to an electric arc, it partially decomposes. In the presence of moisture and impurities it produces acid by-products that attack metal and the insulating envelopes. An efficient way to reduce by-products is to use activated alumina inside the chambers containing the gas. SF6 being a gas at normal temperatures, and at atmospheric pressure it liquefies at -60 °C, and at 20 bars it liquefies at 20 °C, which is detrimental to its insulating qualities. For applications at very cold temperatures, it must be heated or mixed with other gases like Nitrogen or CF4. The first high voltage breakers were the bulk oil circuit breakers, followed by the minimum oil circuit breakers. In an oil circuit breaker, the arc decomposes part of the oil into gases composed of 70% Hydrogen and 20% Acetylene, and also produces carbon particle. It consists of a steel tank partly filled with oil, through the cover of which are mounted porcelain or composite insulating bushings. Contacts at the bottom of the bushings are bridged by a conducting cross head carried by a wooden or composite lift rod, which in common designs drops by gravity following contact separation by spring action, thus opening the breaker. An air cushion above the oil level serves as an expansion volume to prevent pressure from building up inside the chamber after the interruption of the short circuit current. – Frequent bushing failure, etc. These breakers were developed for 170 and 245 kV systems, the highest voltages at the time, where the inherent problems of bulk oil breakers were the most severe, also to eliminate oil as insulating medium and thus reduce the quantity of oil in switchgear installations to an amount that would not cause any hazard. The excellent arc-quenching properties of oil, however, were used later in specially developed oil- and pressure-tight arc-interrupting chambers. Minimum oil circuit breakers for high voltage are single-interrupter up to 170 kV and multiple-interrupter breakers for 230 kV and higher. Contacts are placed in a cylindrical, insulating envelope, with connection terminals at either end, and placed on an insulating support. Compared to a bulk oil breaker, ground isolation is considerably improved by the elimination of the vulnerable isolating bushings and of the metal tank in proximity of the arc. The oil no longer insulates to ground, and oil volume is reduced by a factor of 10 to 20. They use an arc-control device in the arcing chamber which physically shortens the arc and the arcing time, thereby reducing the arc energy. When the breaker interrupts small currents, the arc is extinguished by a forced axial flow of oil. In short-circuit range the arc is quenched as a function of current. The arc is blown by a jet of oil at right angles to its axis, and extinguished. Most of minimum oil circuit breakers are designed for fast reclose. They have to be able to interrupt short circuit currents twice in a row with 0.2 sec to 0.3-sec interval, therefore the arc-control device has to contain enough oil to succeed in performing the second interruption. Until recently, the air blast circuit breakers have dominated the high and very high voltage applications. From 170 kV to 800 kV and breaking capacity from 20 kA to 100 kA. Over 100 kV the breaker has multiple chambers connected in series. Each element is optimized to around 80 kV. At first, 800 kV breakers had 12 chambers in series per phase, now they have only 8 chambers per phase. Although increasing the air pressure increases the speed of dielectric regeneration, it is still relatively slow. Insertion resistors are often used to reduce voltage surges. Air blast circuit breakers adapt well to the high-voltage power network’s new demands. For example, adding insertion resistors, single or double step, to reduce closing voltage surges, is easily done. Also, it is capable of achieving very fast breaking times, 2 cycles and even less, improving the network’s stability. In general, air blast circuit breakers are high tech and robust equipment, with great electrical and mechanical endurance. Contact wear is low due to the short arc duration and low arc voltages. Sulfur hexafluoride (SF6) gas has proved to be an excellent arc-quenching and insulation medium for circuit breakers. SF6 breakers are available for all voltages ranging from 14.4 kV to 800 kV, continuous current up to 4000 A, and symmetric interrupting ratings up to 63 kA. SF6 circuit breakers are either the dead tank design, or the live tank design and the GIS design. During recent years SF6 circuit breakers have reached a high degree of reliability, and they cope with all known switching phenomena. Their completely closed gas system eliminates any exhaust during switching operations and thus adapts to environmental requirements. They may be installed horizontally or vertically, according to the structural requirements of the substation. The quick dielectric regeneration of the arc plasma in SF6 makes insertion resistors unnecessary, simplifying the apparatus. Their compact design considerably reduces space requirements and building and installation costs. In addition, SF6 circuit breakers require very little maintenance. All of this backed with the experience and sense of judgment of the testing personnel. Data Analysis is the final step of the timing test. The professional in charge has to have good knowledge of both the circuit breaker being timed and the network requirements. Since timing machines, nowadays, incorporate powerful analysis tools, a good knowledge of these tools is very helpful and time saver. He has to have also a developed analytical sense and to be able to distinguish between the importance of the requested results and the consequences of non-conformity. In addition to the entire above, one of the important factors in good data analysis is always experience. The circuit breaker has to comply with user requirements, in addition to the international standards specifications. The designer takes into account these requirements when designing a particular circuit breaker. The operation time references and tolerances are established, based on tests and a reference table, called a timing chart, is drawn up. The timing chart contains time references for all the operation cycles the breaker is meant to accomplish. In addition to these time references, the designer may consider it useful to note other times to insure proper function of the breaker or any of its subassemblies. 2. Suspend commissioning operations and take further actions in order to correct any faulty condition. In the first case, putting an unsuitable breaker in service would have disastrous consequences, either to the equipment or to the maintenance personnel. In the second case, the cost would be enormous if it turned out to be unnecessary as a result of an incorrect analysis. Good analysis and distinction of priorities are crucial. Reducing the duration of short circuit currents on power transmission lines is a permanent objective. The main advantage is higher transmitted power, since the power transmission stability threshold is higher when the short circuit duration is shorter. The user determines the current interruption duration, For example 2 cycles. 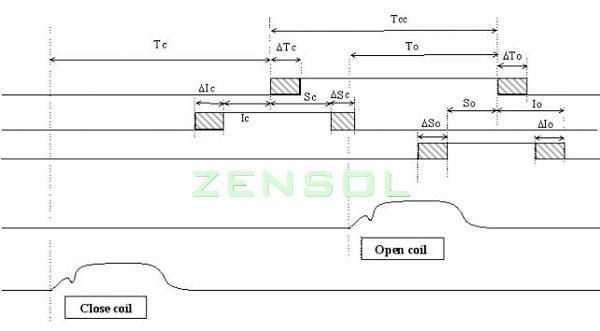 The duration of the current interruption is counted starting from the instant the main mechanism coil energizes until the final interruption of the current in the main contact, including the arc duration. The interrupting time is then equal to the mechanical time (operation time) plus the arc duration. Since the timing test is done with the breaker out of circuit (no load), the arc duration is not measurable. The arc duration depends on several factors: voltage level, interrupting medium, interrupting techniques, etc. It is determined during the design testing. The “TRIP” time is then adjusted to obtain the interrupting time. The “TRIP” time is then, first and foremost, a user requirement the designer has accepted to respect. Nevertheless, an inappropriate “TRIP” time may cause important risks of different natures for a longer time or shorter one. Many risks can be caused by a too long “TRIP” time. It can be anything from a simple anomaly in the tripping control circuit to a major failure in the main interrupting circuit. The analysis should take care to examine all details to reach a precise conclusion. Breakers’ characteristics play a fundamental role. Listing all probable cases is impossible. In general, and independently of breaker’s type, a longer “TRIP” time can be caused by a slower transition speed, the arc duration may be longer and premature contact wear may take place. For small capacitive currents, the voltage spikes are strong and may cause a consecutive fault. Consecutive faults are line to ground short circuits, consecutive to an interrupting of small capacitive or inductive currents. The breaker that is interrupting a small current sees its current growing instantly to full short circuit current. Some breaker types have difficulty in correcting this situation. A known method to overcome the consecutive fault is to interrupt with high speed breakers. Lower speed can be crucial in this case. Reduced tripping speed can compromise the operation of the breaker and possibly that of the power network itself, not to mention the risk of consecutive faults. Following a short circuit, the nominal alternating current flowing in the circuit grows instantly to a huge value, of the same nature and frequency called thesymmetrical short circuit current. Due to the network’s inductive nature, a temporary DC component adds itself to the symmetrical short circuit value. The result is called an asymmetrical short circuit. The initial value equals the instantaneous value of the symmetrical short circuit at the point of the short circuit with a negative sign. It decreases afterward, following a damped exponential curve, with a speed determined by the time constant of the circuit. The breaking capacity of a particular breaker, is the highest value of current the breaker is capable of interrupting. The breaker is supposed to interrupt successfully every current equal or less to its breaking capacity, whether the current is symmetrical or asymmetrical. Considering the curve in figure 4.2.1.3b, one notes that the asymmetrical value is function of the interrupting time. If it is higher, if the interrupting time is shorter. As a result, if the breaker is too fast the asymmetrical value can exceed its breaking capacity, and breaking is no longer ensured.. The curve of figure 4.2.1.3b shows the nominal value of the aperiodic component as a function of the opening time of the breaker. This curve uses a damping time of 20% per hundredth of a second. The “TRIP” time should never be less than the reference value, otherwise the asymmetrical short circuit value can exceed the breaker’s breaking capacity. High voltage breakers are three-phase apparatus. It contains at least one contact per phase, and in some cases, multiple contacts in series per phase, up to 12 per phase for certain air blast breakers at 765 kV. It is crucial for the proper operation of the breaker and of the network to limit the time discrepancy between the contacts. 2. Contact discrepancy in the same pole. 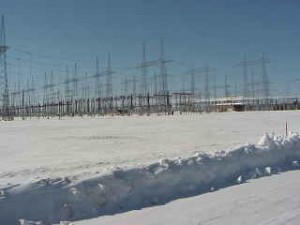 According to IEC 56 (parag.3.3.1) the phase is considered open when the first contact of the pole is open. The biggest discrepancy measured should not exceed a maximum value set by the designer, the user, or by an agreement between them. 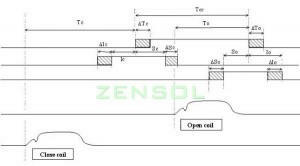 Poles’ contacts separation has to be simultaneous to prevent high voltage transients, otherwise it would attain double the rated value on the first parting pole. The maximum discrepancy allowed is 1/6th of a cycle. According to IEC 56 (parag.3.3.2) the phase is considered closed when the last contact of the pole is closed. The biggest discrepancy measured should not exceed a maximum value set by the designer, the user or by an agreement between them. The sudden energizing of circuits is always followed by a moderate voltage increase, with the exception of long, unloaded transmission lines, where the voltage rise can be critically dangerous. When a line is connected to an energized network, a voltage wave is forced on the line. This wave is reflected back at the end of an open line, and returns with double the amplitude. Even higher voltages may be encountered when the line has a load before being reenergized, and if the breaker closes at the moment that the polarity of the network is opposite to that which was present on the line. The voltage may then be three times the network voltage, after reflection of the wave. This situation may be produced with a rapid reclose of a line. Still higher voltages may be encountered on three-phase lines, when the three poles of the breaker do not close simultaneously. A wave on one phase will produce induced waves in the other phases, and under unfavorable conditions, will increase the voltage on another phase. Higher transition voltage rises can be encountered if the discrepancy on closing is too high. Note that on networks where the nominal voltage is 500 kV and higher, the isolation of the lines is determined by the operation voltage spikes. For multiple-contact-per-pole breakers, grading capacitors are installed in parallel with each contact to equalize the voltage when contacts part. In general, the fastest contact has the longest arc duration and higher contact wear. In case of excessive discrepancy, the fastest contact on close and slowest on trip would cause higher voltage shocks to their grading capacitors, thus reducing their life expectancy and that of the contacts. During closing, especially on short circuits, opposite forces are considerable. In case of slow moving contacts the pre-arc has a longer duration thus causing more contact deterioration. If the closing time is not respected, this would compromise the relative guarantee to the closing capacity. This time is usually supplied by the designer of the circuit breaker. An operation cycle is a sequence of basic “CLOSE” and “TRIP” operations in specified time intervals. CO cycles simulate closing on a short circuit. In the actual event, the breaker closes first, then the protection relay system detects the short circuit and trips the breaker. In the test event the timing machine can be programmed to launch a trip command as soon as the contacts close. This gives the fastest short circuit time the breaker is capable of doing. This value is compared with the designer’s references. Experience shows that a great number of short circuits are temporary. It means they are caused by an event that disappears shortly after the breaker opens. A few examples are: short circuits caused by lightning, a bird, fallen trees or branches, etc. The purpose of fast Reclose is to reduce the duration of power interruption. It is important to reduce this duration to a minimum. For the out of service circuit, it is important to give it enough time to clear the fault. In effect, temporary faults create arcs; once the power feeding this arc is cut, enough time needs to pass for the arc plasma to deionize before reconnecting power, or another trip may occur. Statistics show that a 0.3 sec duration between the contacts opening and the contacts closing is enough to achieve this goal. If on closing another trip occurs, the breaker will have to interrupt the short-circuit a second time. There will have to be a sufficient delay between the interruptions for the interrupting medium to regenerate, so the second interruption will be performed correctly. If the breaker trips a second time, it should remain open. Automatic fast reclosing avoids tripping between two interconnected sources. In effect, when breakers on an interconnecting line between two networks trip, there is a rapid loss of phase synchronization if this line is the only one interconnecting them. If there is another line running in parallel, it may trip in turn by overloading, which causes a loss of synchronization. This de-synchronization may be avoided, when the faults are temporary, by quickly reclosing the breakers before the phase shift becomes too great. If the tripped circuit is three-phase, the reclosing time must be very short, on the order of 0.3 seconds. If the reclose time is longer, there is a risk of closing on a phase discordance. During timing tests, the O-0.3s-CO test verifies the behavior of the circuit breaker in this particular type of operation. On Reclose-Open timing test event, the timing machine is programmed to delay the closing command until the isolation time of 0.3 seconds is obtained. This delay must not be confused with that of certain type of delaying devices installed on some breakers, even if these times are similar. All of this backed with the experience and sense of judgement of the testing personnel. POUARD (M) – Appareillage électrique. Fonction de l’appareillage. Problèmes généraux. POUARD (M) et COUVREUX (J.P.) – Appareillage électrique. Étude pratique des divers types d’appareillage à moyenne et haute tension. TRENCHAM (H) – Coupure des circuits. CONFÉRENCE INTERNATIONALE DES GRANDS RÉSEAUX ÉLECTRIQUES À HAUTE-TENSION (CIGRE) – Comptes rendus des travaux de sessions, 1re Section Groupe 13. CASSIE (A.M.) – Une nouvelle théorie de l’arc et de la coupure. CIGRE 1939 Rapport no 102. SKEATS (W.F. ), TITUS (C.H.) ET WILSON (W.R.) – Taux de rétablissement de la tension dans le cas de défauts sur les lignes de transmission. TESZNER (S), MAURY (E) et PEROLINI (M) – Surtension de coupure, moyens de les atténuer et possibilités d’une réglementation des interrupteurs. CIGRE 1954 Rapport no 147. MAURY (E) – Problèmes apparaissant aux tensions les plus élevées lors de la manoeuvre des disjoncteurs. CIGRE 1964 Rapport no 138. DUBANTON (C) et GERVAIS (G) – Surtensions de manoeuvre à l’enclenchement des lignes à vide. Influence de la puissance et de la configuration du réseau. Répartition statistique. CIGRE 1972 Rapport no 33-05. MOUTON (M) – Les disjoncteurs-sectionneurs associés à des fusibles et les interrupteurs-sectionneurs. FERNIER (B) – Les interrupteurs à coupure en charge en moyenne et haute tension. HOFFMANN (D) – Interrupteur de sectionnement C.I.R.E.D. 1975 Rapport no 25. MAURY (E) – Évolution des disjoncteurs des réseaux de transport 1971. PEROLINI (M) – Disjoncteurs à air comprimé pour des réseaux à haute tension 1955. FRIEDRICH (R.E.) et BATES (G) – L’utilisation du SF6 pour l’interruption haute tension) 1958. ARTHUR (A) – Préparations, propriétés physiques et chimiques et applications générales de l’hexafluorure de soufre 1962. PRIGENT (H) – Mécanisme de l’enclenchement et de la coupure des batteries de condensateurs raccordés en dérivation dans les réseaux moyenne tension. 1954.